The beauty of OneDesk is that it allows you to capture feedback from a variety sources without them getting lost. Whether customers or colleagues choose to send you feedback from email, social media, or from the customer portal, they will all arrive in OneDesk’s Feedback Application. Once feedback has arrived in the feedback application, what do we do? Once received, it’s time to take action and move them forward, or identify them as feedback that has already been implemented. 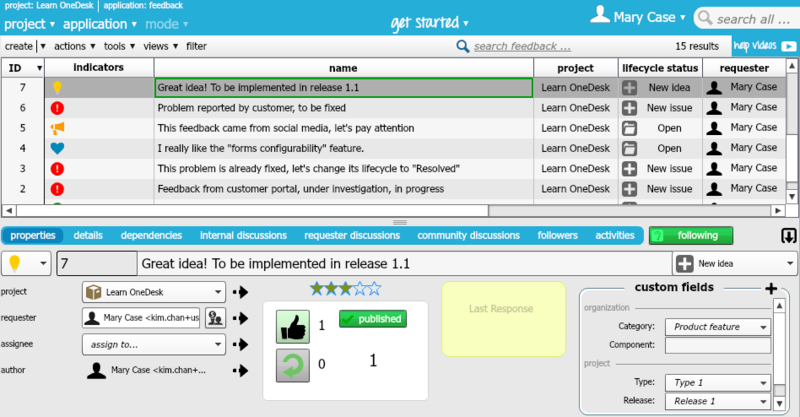 – Set its lifecycle status to keep colleagues updated on the feedback’s status. You can also choose to keep customers updated on the status of the feedback they submit, via the customer portal. – Link feedback to related ones, requirements, issues or tasks. This creates traceability and allows team members to understand the origins of the item they are working on. View this video for a quick tour of OneDesk’s feedback app.